We understand that buying a pool is a huge decision. Our goal is to empower you with honest and reliable swimming pool cost information to help you budget for your project. This inground swimming pool cost and pricing guide will help you develop an initial budget and plan for the ownership costs associated with each type of inground pool. Want a comprehensive buying guide that answers not only budget questions, but all common questions people have when buying an inground pool? Check out our FREE eBook, How To Buy A Fiberglass Pool in 2019. Check out our article Top 6 Hidden Costs of an Inground Pool Project to learn more. 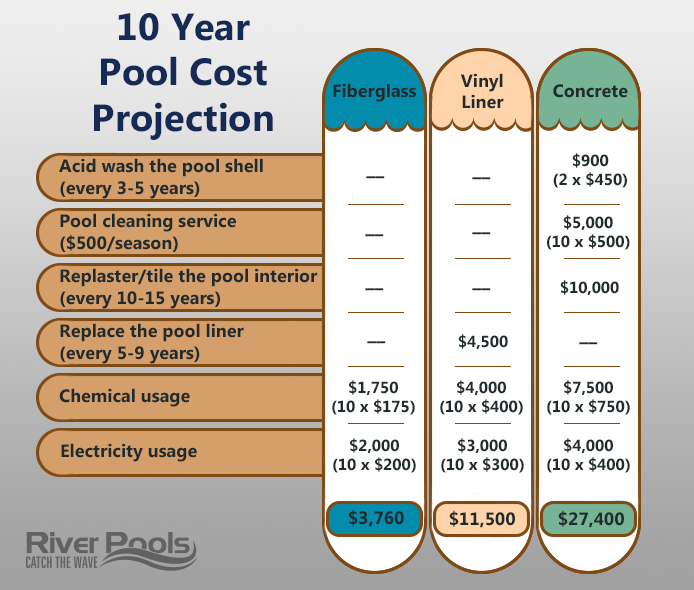 Check out this more in-depth explanation of fiberglass pool prices. You can also receive an online fiberglass pool quote of your own. How Much Does It Cost to Replace a Concrete Pool with a Fiberglass Unit? Now, let's take a look at how much it costs to own each type of pool over time. You can see the huge disparity between the maintenance costs of these three types of swimming pools. Why is the cost to own a fiberglass pool so much less? First, they are incredibly durable. Second, they are very efficient. Modern fiberglass pools are so durable because of the scientific developments in the pool's gelcoat layer that have occurred over the past decade. The gelcoat layer is the part of the pool we see and touch. Modern gelcoats will last decades, or possibly even a lifetime. This eliminates the need for costly refinishing. In contrast, concrete pools will require expensive resurfacing every 10 to 15 years, on average. And you can plan on replacing the liner in a vinyl pool every 5 to 9 years, on average, at a very high cost. Fiberglass pools are incredibly efficient because the gelcoat layer of the pool is non-porous, preventing troublesome algae from embedding into the surface. This equates to less chemical usage, less time maintaining the pool, and the ability to run the pump and filter in shorter cycles or at lower speeds depending on the system. This makes for substantial energy savings. To sum it up, you will have significantly less maintenance and repair expense with a fiberglass pool. Couple that with the lower cost of chemicals and energy usage, and you have, far and away, the most affordable pool to own on the planet! That's inground swimming pool pricing in a nutshell. Check out the other questions below to continue your journey to find the perfect pool. You can also further explore the differences between fiberglass, concrete, and vinyl liner pools. 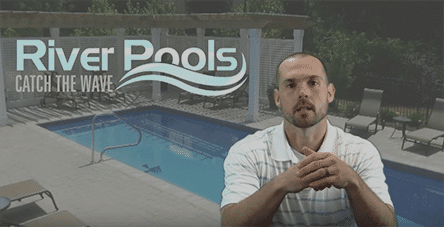 Seasonal Savings and Inground Pools: Is Spring or Fall/Winter a Better Time to Install?